Endeavor was founded in September 2015 when Ian C. Hess saw the space at 316 Brook Road became available. Immediately he reached out to the most talented artist he knew from his studies in Fine Art at Virginia Commonwealth University, Eli McMullen. Over a beer and a concept it was time to get serious about our artwork. As a practicing artist in the studio previously occupying the space, Wingchow jumped at the opportunity to create something personal and thus Endeavor was born. We are forever grateful for the opportunity to display our art to the public and work with so many passionate people who help us realize everyday that it’s not impossible to turn something you love into a career - if you’re dedicated enough. We welcome anyone and everyone to get to know us, the studio and to continue building the creative community. Character, concept, and form are always at the center of my artwork. Often my characters end up faceless, or their identity being the suggestion of something much bigger, or even impossible. In studying portraiture, I found a resonance with antiquity and iconoclasm that's resulted in bizarre color palettes, fractured forms, and emotional expressions through recognizable imagery. Whether steeped in reference or from imagination, my works seek to find a balance between opposites such as sharp yet soft, solid yet transparent, repetitious yet unique. Taking on many different forms, meanings, materials, and concentrations - my work has continued to evolve beside my artistic capabilities. As of late, I've taken inspiration and reference from Greco-Roman busts. Wing Chow’s work focuses on the creation of form through the use of amorphous, organic shapes. Many of her paintings begin without reference, existing in a highly reactive state of flux until the main image begins to develop. Color choice precedes imagery, which then emerges through a push and pull process between an intuitive flowing movement and the corresponding, calculated response. 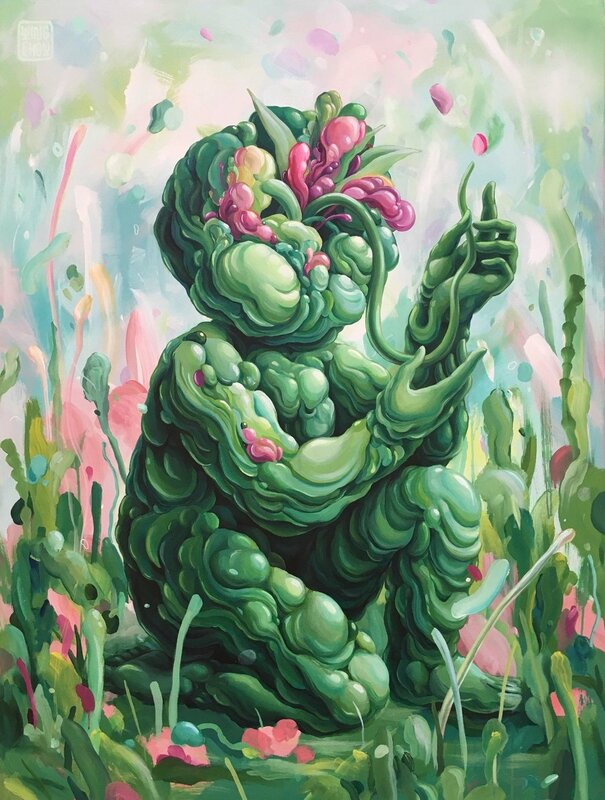 Chow is inspired by both the whimsical and the visceral, often resulting in cartoonish characters which are both playful and grotesque. The work aims to explore the malleability and versatility of form without preconception; staying open to constant evolution. My work investigates the environments within my paintings through the dynamics of landscape and structure. My influences stem from urban architecture; breaking down combinations of geometric shapes and designs to reconstruct them into ever-changing compositions. I am inspired daily by my surroundings and I regularly take photos to capture the mood or experience of the moment. Referencing these photos, I aim to represent my initial interaction with the space, yet allow the organic abstraction of the lines, forms, and colors to take focus to create otherworldly situations and new possibilities of reality. My work lies in the business behind the space. Through my experience in event management and my studies in communications I found a passion in working with creatives. Now, I connect clients with artists and artists with opportunities. I'm here to make fine art accessible. As our business manager, you may find me producing media, managing our programs or collaborating with organizations. Grounded in the belief that art improves the quality of life in any community, my work gives artists the opportunity to pursue their talents and create more. All in all, it's people like you reading this right now that make our careers possible. We can't thank you enough for your support and recognition.